Between the 20th of February and the 11th of March 2000, one of my best friends and I went on a trip to South-America; traveling to Chile and Argentina to visit both countries, experience both cultures and have a taste of their respective wines and food traditions. A magnificent journey of 20 days, backpacking, trekking and winery hopping to discover a fascinating world where mother Nature still prevail and human being can only be admirative and barely influence it. We landed in Santiago, the capital of Chile, where we shortly stayed before beginning our expedition to the majestuous massif of "Torres del Paine". We took a plane from Santiago to Punta Arenas, where we ended up massively drunk and didn’t see much of the town, despite our good intentions to do so. It was without counting on our encounter with a funny French Canadian that we met in the first food joint that we could find. We started with beers to push the food down, but were taking off guard when he unveiled a magnum of Jack Daniels from his backpack. Franck and I are huge fan of J-D and the "Tavernier" let us drink it as long as we continued to order more beers. Therefore, it happened to be early morning the next day, much sooner than we thought. And, running like wild animal in the maze of this little port-town, we nearly missed our minivan-bus which was about to drive us and a few other locals to Puerto Natales... where, in turn, we took a boat for a few hours, during which we couldn‘t stop contemplating the beauty of the surrounding mountainous landscape and the immense shattered glaciers breaking up huge blocks of ice into the Chilean fjords, drinking the local “Pisco” by the shots at the rear of the boat with the captain barely paying attention. Fortunately, we were the only two persons on the boat, despite the captain and his mate (in the literal sense of the term of course, but also in the metaphorical sense too, because "Mate" also is a traditional South American infused drink, particularly in Argentina, Uruguay, Paraguay, southern states of Brazil and south of Chile. But after the previous night and the Jack Daniels ambush in which we felt lamentably, "Pisco" seemed somewhat more appropriated than "Mate", while not necessary it felt like a proper continuation of our nocturnal impromptu celebration. Once arrived in front of the magnificent, yet somewhat scary massif, proudly pointing its peaks like sharpened teeth towards the sky, we knew that we had only one choice: to trek as much as we could, about 8 to 10 hours a day, for the next 6-7 days, to complete the entire tour of the beast. It was amazing! We walked hours without seeing a soul, only surrounded by the mountain and its grandiose presence. It was even lonely and creepy at time, but majestic. We were sleeping in tent or in some of the refuges scattered along the way at night, sometimes washing ourselves in the river and drying our cloths by the bonfire some nights; and cooking our frugal meals in the flames, often climbing high into the deep marine blue sky alight by the incredible visible amount of stars. It was really amazing and frightening at the same time, tiring and revealing too; yet what a tremendous personal achievement for the both of us. Full of unforgettable moments, momentum and memories of a place where Nature seems untouched and humans appear rather insignificant and powerless. I felt in love with this part of the world and both of us were somehow happy to go back to civilization, but also sad to leave such a magical and touching place. We came back to Santiago and its surrounding to visit the city itself, where we were staying in a backpacker’s motel, but more especially some the wineries in Casablanca Valley, San Antonio Valley, Cachapoal Valley, Maipo Valley, Curico and Maule Valley. Some of the wines that we tasted and some of the appointments were organized by the importers and distributors that I used to work with when I was a Sommelier/Wine Buyer in London at the time. Amongst others, our first visit was Cousino Macul and since then it became sentimental between the wines from this particular winery and me. After a few days spent in Chile, we decided to cross the Andes to go on the other side of the Chilean boundary, in the neighboring country called Argentina, to explore the myths and legends of the Malbec revolution in the wineries surrounding the town of Mendoza. It took us quite a few hours (at least 6 hours minimum by mountainous, treacherous roads between the two cities) to arrive at the top of the mountain where the customs’ baraquement of Las Cuevas didn’t offer much of a refuge against the freezing temperatures awaiting us at this altitude. It was warm and comfy in Santiago, but that wasn’t the case atop the Andes. Of course, we only had a tee-shirt and a thin sweater on our skin, the rest was in our backpack; and the local police asked us to line-up against the wall like prisoner or more like condemned, in order to, at their pace and at 2 o’clock in the morning, verify our passport and our legality before we enter the Argentinean territory. After awhile, taking their time to search all of our backpacks, (imagine the time to check an entire bus full of tourists and locals), they let us through, while I smoked about a packet of cigarette, freezing to death for the last few hours (yeah, I used to smoke, I know, I know….). Mendoza was rather small compared to what I was trying to picture looking at the travel brochures and guides. The center of the town was obviously the main interest, a huge square surrounded by low rise building, with restaurants and boutiques. We didn't spend much time there. We rented a car and went on the winery road towards the southwest at the foothills of the Andes. In 3-4 days, we visited quite a few of the most well-known wineries at the time, including Bodega Norton which was probably the most memorable (at the time) and many others. What really stroked me the most, despite the beauty of the landscape and the "paysages", was the enormous size of the cement/concrete vats that we discovered in some wineries. Although not in use anymore, one of them was the size of a large 3 or 4 bedrooms apartment, a huge circular concrete vat maintain by multiple pillars that could contain thousands of hectoliters. We were about 20 tourists regrouped inside with the guide and there was still room a lot more people. Unfortunately, I do not remeber the name of the winery, but it was colossal. The winery itself without counting the surrounding vineyards, extended on 10 hectares above and underground. It was huge. I have seen many wineries in my lifetime, but never one that monstrous. (I will try to find the name soon). One of the most funny moment that we had in Argentina was on the road to the no-man's land: La Pampa. If you drive south of Mendoza from Lujan de Cuyo to San Rafael, (I don't remember if it was in the village of Lujan de Cuyo itself, or in one of the next two tiny villages of Agrelo or Ugarteche); however, at the southern end of one of those "bourgs", you explicitly get a sense of getting close to the no-man's land, in other term "La Pampa", because at the exit of a tiny gas station, a huge billboard acknowledges you that you should fill up the tank of your vehicle, because you won't able to do it for the next 175 kilometers. Anyhow, I would love to continue to detail our adventure, but it will be rather too long for this post. However, here again, just writing about this trip in Chile and Argentina brings back a lot of memories and unforgettable moments, that I wish I could have the time to share with you. As a result of visiting Mendoza and its surrounding wineries, I once again felt in Love, this time with Argentina, the breathtaking beauty of its picturesque panoramas, and obviously its steak and its wines. That is why, in memory of that trip, I would like to share with you one of these Malbec wines from one of the Argentinean wineries that I like the most and that I have been selling for quite some time now. Bodegas Luigi Bosca – Familia Arizu – is a story of a legacy and an expertise gained over many years; the story of a name, of a family and their winery; of men who succeeded in conquering virgin soil and in gathering its best fruit. It is the story of a profound understanding of wine and of the constant evolution of all its process. The first Arizu was Leoncio, who at the end of the 19th century, left his homeland of Navarra (Spain), to come to the Andes, where he was greeted by a young but promising business: vine grower. The first years went by, and the native vines gave way to the ones brought from Europe which, slowly, grew older and stronger until they became unique and completely adapted to this new Argentinean ground. Four generations have passed since the time of those early viticulturists and their revolutionary concept of winemaking. From the time the Bodega started to make a name for itself on the international market in the late 1990s up until now, Luigi Bosca winery has always remain consistent in quality and avant-gardist in attitude and profile; mixing the savoir-faire and traditional ways of the old generations with the newest techniques to produce structured and textured gems, resulting from generations of experienced winemakers who are always striving for excellence. Somewhat modern and fruit forward, these attractive and expressive wines do not lack of character or Terroir expressions. On the contrary, over the last decade, they have been recognized as some of the best and most consistent amongst all the Argentinean wines exported in the major wine market like New York and London. They pretty much stand out all around the world in Wine & Spirits boutiques and regarded restaurants. "Finca La Linda": a line expressing flavor, varietal character and fruit in approachable, wallet friendly and versatile wines, in a wide range of varietals: unoaked chardonnay, viognier, Torrontes, Malbec rose, Bonarda, Syrah, Tempranillo, Malbec, Cabernet Sauvignon and even Extra Brut sparkling. "Selectos de Familia Arizu": a line demonstrating the quintessence of Luigi Bosca wines: modernity, innovation, passion and pure Terroir character. It encompasses three different labels: “Gala Collection” (Galla 1, 2 & 3) 3 delightful wines superbly crafted; Boheme Methodo Traditional, their fancy sparkling wine which can easily rival some of the most well-known French Champagnes in the $30-$35 price range. 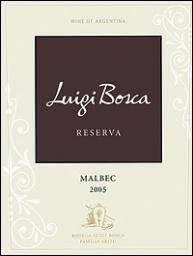 And, in my opinion, their best wine called “Luigi Bosca Malbec Single Vineyard D.O.C”; the only wine in Argentina that can claim to come from a single vineyard recognized as a “Denominación de Origen Controlada” due to its unique Terroir characteristics. The third line is “Luigi Bosca Reserva” which represents the quality, prestige and identity of the wines, the winery and the devoted passion of the men and women behind it. This line also comes in large range of varietal: Chardonnay, Sauvignon Blanc, Riesling, Pinot Noir, Merlot, Syrah, Cabernet Sauvignon, Merlot, Extra brut sparkling and of course the irreplaceable pride of Argentina: Malbec. This wine was crafted with carefully selected and sorted 100% Malbec grapes from low yielding vines planted at Vistalba vineyard in Lujan de Cuyo, an area south-southwest of the city of Mendoza, with an altitude of 960 meters, in the foothills of the Andes. The climate is dry with very cold winters, temperate springs and fresh summers. The clouds from the Pacific Ocean rarely pass above the Andes and usually remain on the Chilean side, transforming the mountain in natural barrier against the rain; yet because of the high elevation, there are big thermal temperature changes between night and day. Average summer temperature: 22º C and average winter temperature: 6º C. Minimum winter temperature: -6º C. Average annual rainfall: 197 mm. The shallow soil is mainly composed of alluvial, clay and abundant limestone resting on subsoil of stone and pebbles, which generate good drainage. Mainly planted on a plateau, the inclination of the vineyard is only about 1.5% west-east and 1% south-north. 2007 was a great vintage in Argentina and so far I can say that most of the Argentinean wines that I tasted from this particular vintage were mostly very good to excellent. We recently received the 2007 Luigi Bosca Reserve and Single Vineyard D.O.C and both really exceeded my expectation for being focus, rich, complex and long. Although I prefer the Single Vineyard D.O.C, I still found it too young and not tamed enough, it will definitely last for quite some time. It has great potential. Aged for 12 months in French oak casks and only lightly filtered before bottling which enable to keep the maximum of natural and essential components and confer it more ageing potential, 2007 Luigi Bosca Reserva Malbec Lujan de Cuyo was more open and approachable now after about half an hour in a decanter. It presented a fairly intense, bright yet dark ruby color with purple reflects on the rim, sign of youth. The nose offered expressive classic Malbec aromas of dark fruit, earth, spices, coffee, ripe plum, violets and purple flowers, with hints of mineral and subdued oak notes. The medium-to-full palate was focused, balanced, well rounded and fairly soft yet rich, complex and earthy, with enhancing acidity and integrated tannins. The lingering finish is quite juicy and structured, making this textured wine a pleasurable drink to pair with earthy, substantial dishes like stewed, roasted or grilled red meat, venison, game and hard cheese. A true classic, elegant and gutsy Malbec that brought multiple memories of my trip to Argentina back in my memory. Cheers to my oldest friend Franck! without whom this trip will have never happened in the first place, if it wasn’t for his determination and methodical organization.